During the First Darkness, the Uthuk Y’llan were pushed to the edge of extinction. The foolish Daqan believed that the forces of the locust swarm were as good as dead—but they were wrong. Now, the Uthuk army has returned stronger than ever, using their link to the Ynfernael to fill their ranks with more advanced fighters. 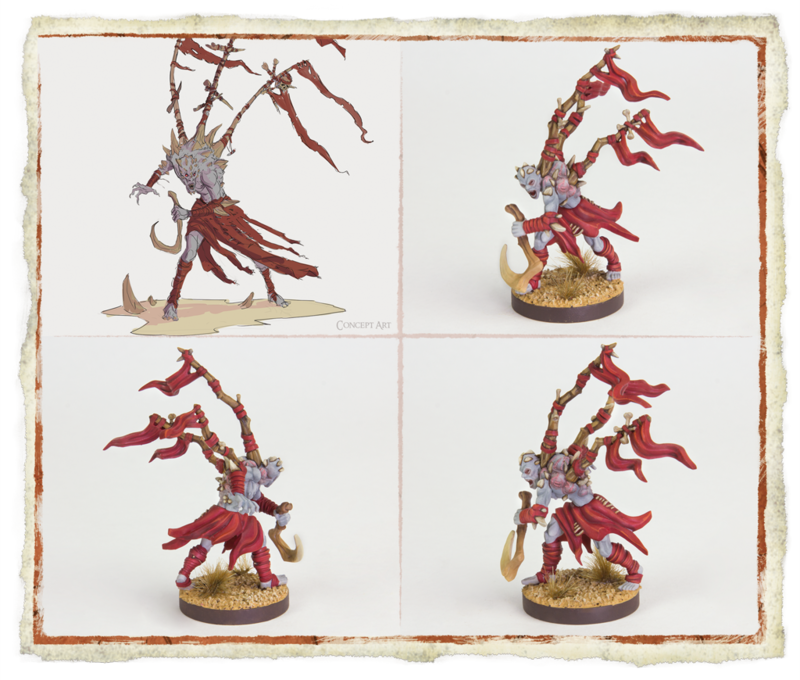 Complete with blood witches, shriekers, grotesques, and warsprinters, the Uthuk Y'llan's infantry command are ready to face off against even the most highly trained armies of Terrinoth. 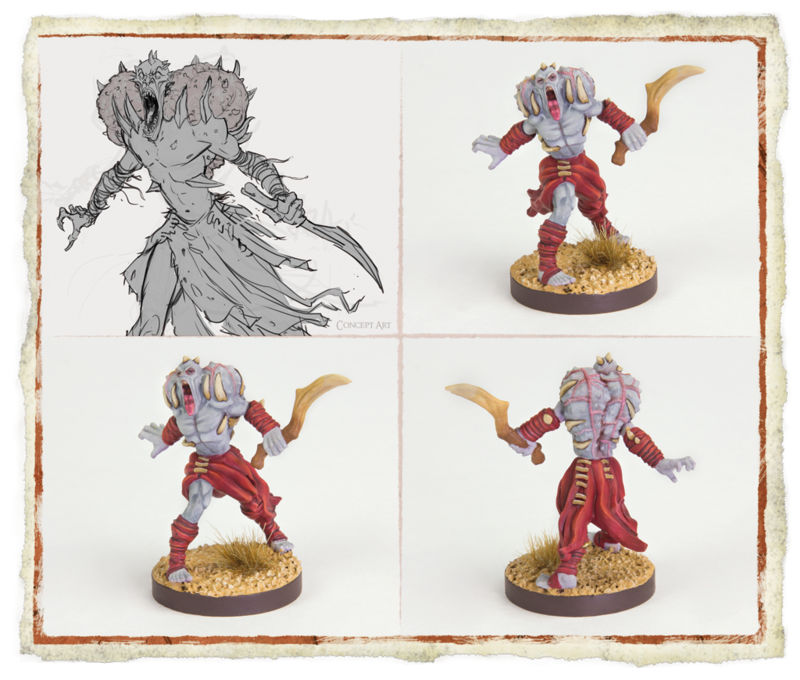 Today, we offer you a closer look at the demonic warriors who can strengthen your locust army with the Uthuk Y’llan Infantry Command Unit Upgrade Expansion for Runewars Miniatures Game! 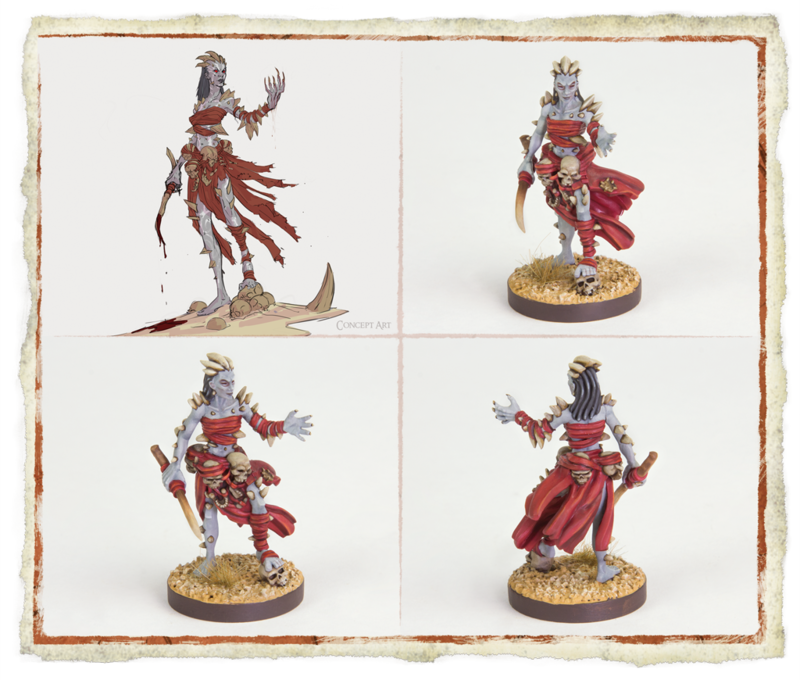 The witches of the Blood Coven lead the armies of the Uthuk Y’llan into battle with an unparalleled ruthlessness, using their power over the Ynfernael to bolster their forces through horrific rites. These hags are as cunning as they are bloodthirsty. They will never ride into a battle where they are at a disadvantage, even if it means they must inflict self-harm to strengthen the greater host of the locust swarm. 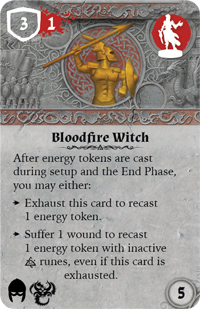 After energy tokens are cast during setup and the End Phase, a Bloodfire Witch may exhaust her upgrade card to recast an energy token. Even after the upgrade has been exhausted, the witch may inflict a wound upon herself and, in exchange for her sacrifice, recast an energy token with inactive unstable runes, helping to ensure that your connection to the unstable forces of the Ynfernael remains strong. The witches of the Blood Coven have many areas of expertise, any of which may fit nicely into your battle stratagem. 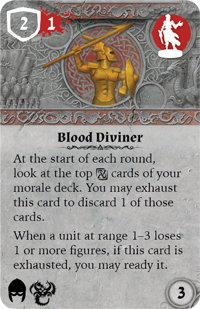 Having a Blood Diviner in your infantry offers you a special ability at the start of each round. The witch may use her dark powers of foresight to look at the top cards of the morale deck—up to the number of stable energy runes in play. If you choose to exhaust this upgrade, you may discard one of those cards. But this is not simply a one-use ability. If you offer the Ynfernael a blood sacrifice whenever a nearby unit loses at least one figure, you may ready Blood Diviner again. Warsprinters lead the locusts of the Uthuk Y’llan into battle, flying tattered standards from the unnatural spines that erupt from the skin of their backs. 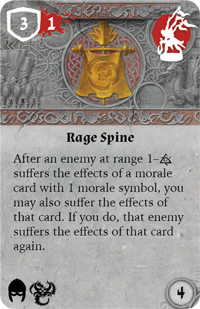 The Rage Spine upgrade states that after an enemy at range up to the number of unstable energy runes suffers the effects of a morale card with a single morale symbol, you may also suffer the effects of that card. In exchange for this sacrifice, you can force your enemy to suffer the effects of that card again. 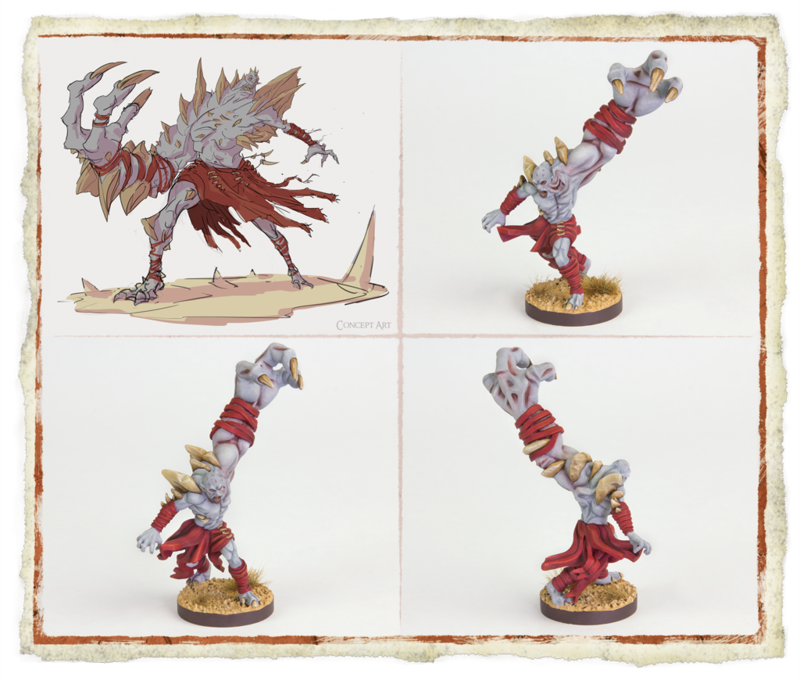 These Uthuk bannermen and their grotesque trophies strike fear into the hearts of any who witness their sick traditions of adorning their spines with the bones and skulls of fallen foes. 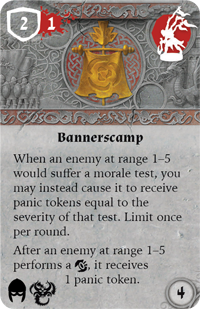 The Uthuk Bannerscamp equips you with a powerful ability, stating that, once per round, when a nearby enemy would suffer a morale test, you may instead cause them to receive panic tokens equal to the severity of that test. Beyond this, when an enemy at range one to five performs a rally action, that enemy also receives a panic token. When the warsprinters take to the field, no amount of inspiration can shake the dread that they spread among enemy ranks. Among the warriors of the Uthuk Y’llan, few would dare to defy the witches of the Blood Coven. The Shriekers serve as a living reminder as to why. Once Uthuk tribesmen, the Shriekers are cowards who willfully defied the witches and now face their just punishment. Kept alive with black magic, the tribesmen had their lungs ripped from their bodies, engorged, and then reattached. After this torture, their jaws are permanently unhinged and their minds burned with madness until no personality remains. These living shells now convey the tactical instructions of the witches when the locust swarm marches forth to battle. Shriekers inspire fear from their enemies and loyalty from the warriors of the Uthuk Y’llan. 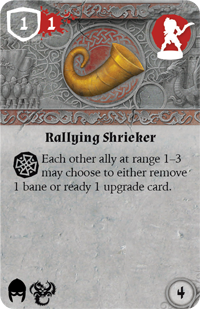 In the heat of battle, a Rallying Shrieker can use a skill action to bolster their fellow warriors, allowing each ally between ranges one and three to either remove one bane or ready one upgrade card. Meanwhile, a Tactical Shrieker can navigate the chaos of war with ease, enabling its unit to disengage from enemies without receiving panic tokens. The Tactical Shrieker also has a defense value of four, making them ideal frontline fighters and difficult for your opponent to remove. Not all members of the Uthuk army fear the terrible power of the Ynfernael. Some tribesmen embrace it and even offer themselves in sacrifice, praying for a dark blessing. Those who receive the favor of the Ynfernael become Grotesques—hulking monstrosities with minds twisted by maddening bloodlust. Free from the bonds of mortal needs and the instincts of self-preservation, these Grotesques and their disfigured forms are terrible to behold on the battlefield. During either a melee or a ranged attack, a Mutilated Grotesque may exhaust their upgrade card to add a morale modifier. 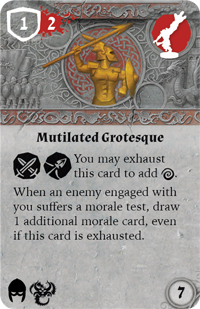 In addition to this more limited ability, whenever an enemy engaged with the Mutilated Grotesque suffers a morale test, you may draw an additional morale card, even if the Mutilated Grotesque card has been exhausted. With their minds and wills burned by their glorious ascension, Grotesques care not about the suffering of their mortal bodies. They are beyond the earthly plane and once they take to the battlefield, all shall know the enlightenment that can only come from true suffering. Rise from the ashes and set fire to the world of the children of Timmorran. 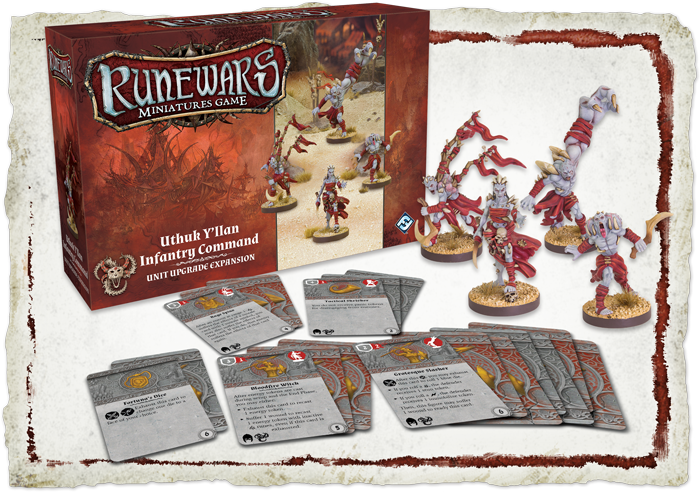 Add the Uthuk Y’llan Infantry Command Unit Upgrade Expansion to your ranks and create a new world in your dark design, with blackened skies above you and blood-soaked ground beneath. 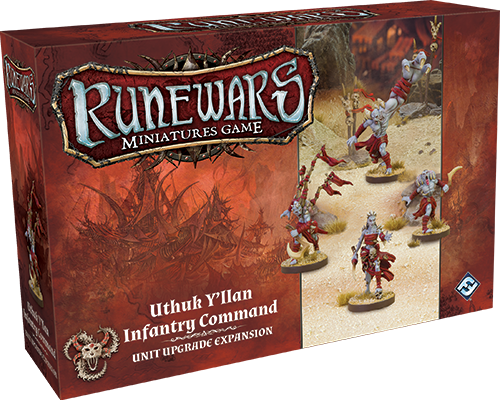 Look for the Uthuk Y’llan Infantry Command Unit Upgrade Expansion (RWM23) when it hits retailers in the fourth quarter of 2017! You can pre-order the expansion at your local retailer or online through our website today.